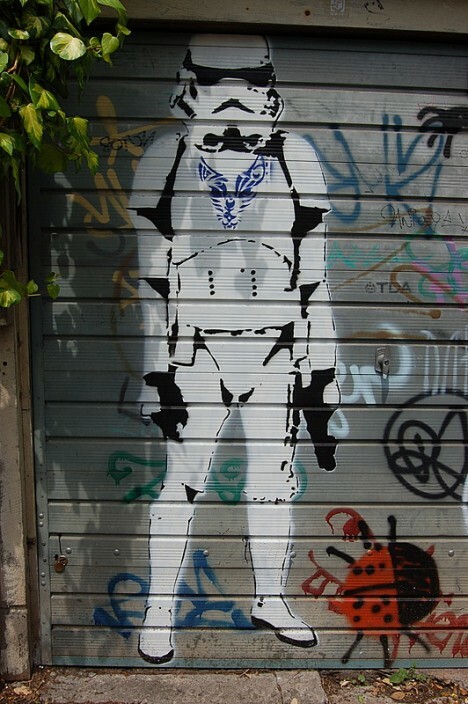 White-armored stormtroopers of the Star Wars universe may be the true face of the franchise if their stenciled images on walls worldwide is any indication. Sure their aim is lousy and low door frames are their nemesis but the stormtroopers of Star Wars have done a decent job of conquering pop culture since their 1977 debut. 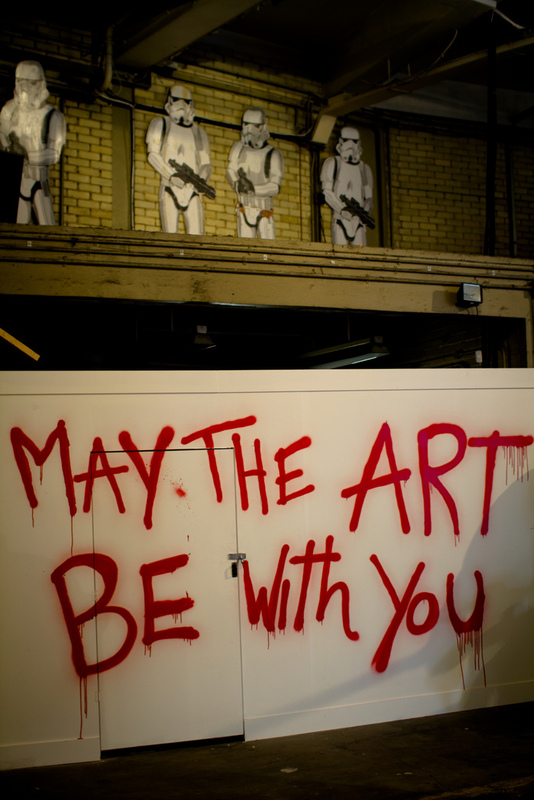 Just ask Los Angeles-based street artist Thierry Guetta – aka “Mr. 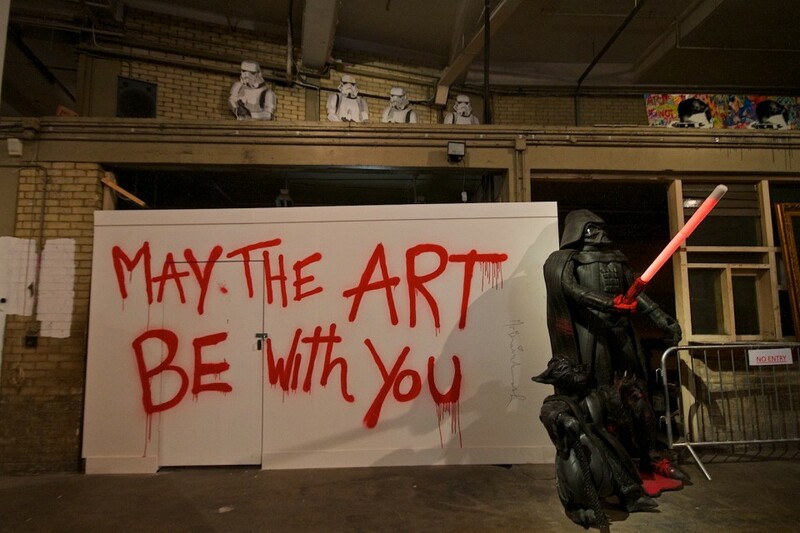 Brainwash” – who employed them in his “Better to Dream Big” art exhibition in 2012. A gentle top o’ the cap to Artc. and Flickr user Jonas Bengtsson (Jonas B) for posting the above images. 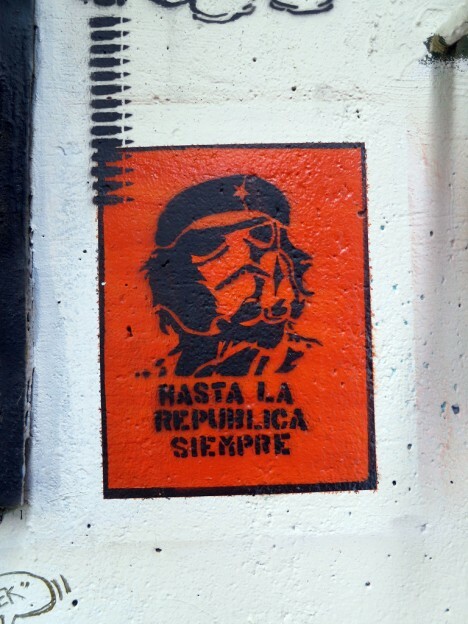 “Hasta la republica siempre” (“To the republic always”) states this subversive stormtrooper stencil snapped by Flickr user Daniel Lobo (Daquella manera) at Washington DC’s Garfield Skatepark on July 28th, 2013. Did this red renegade deliberately disobey Order 66 or merely read it upside-down as 99 reprO? If you start seeing pink elephants after leaving a Brighton, UK pub, maybe you’ve had a pint too many. 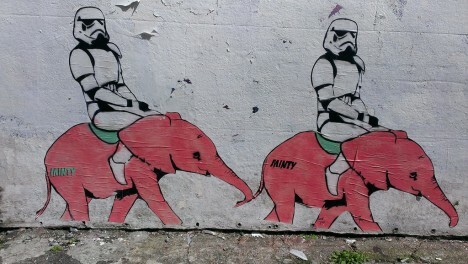 If larger-than-life stormtroopers are riding those elephants, on the other hand, fear not – it’s just the local street art. 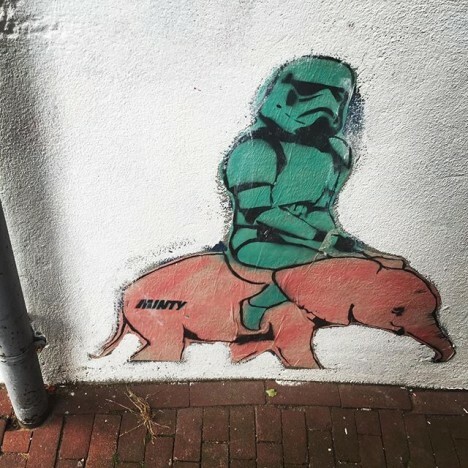 Credit presumed street artist “MINTY”, Flickr user Quick HR (quickhr) and Instagram user @gallie23 for the above mildly hallucinogenic scenes. Right then, back to the pub! 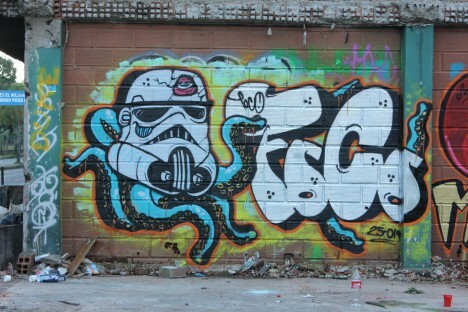 “I love Star Wars and in particular Stormtroopers when used in Graffiti or Stenciling,” states Flickr user Walt Jabsco, who captured this fashionable film fighter on a sunny May 30th afternoon in 2008. “I don’t like the fact someone has given this one a blue pendant or Chest Logo but it’s still cool,” adds Jabsco, and with or without the blue bling we have to agree. May the Foco be with you, amigos! 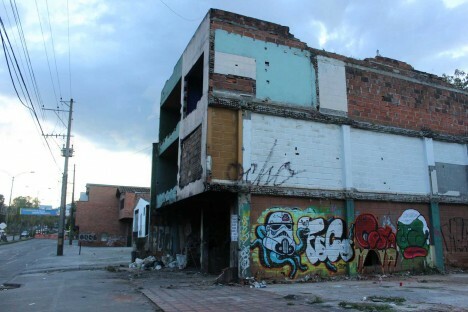 All things considered, prolific graffiti artist Foco’s colorful mural is the highlight of this run-down district in Itagüí, Colombia. 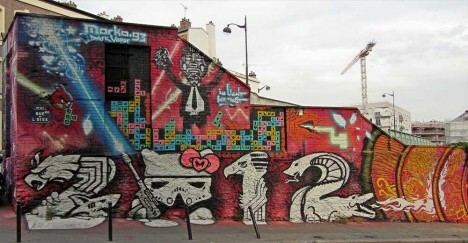 Featuring a cute c’thulu-esque stormtrooper, the mural is captioned “Buena compañía, buenos consejos, las mejores cosa mala” by Flickr user Foco Graffiti, translated as “Good company, good advice, the best bad thing.” Make of that what you will. It’s been over three years since Flickr user Geoffroy65 captured the stunning tableau above, located near the Bassin de la Villette in Paris’ 19th arrondissement. Let it be said that street art this good deserves to be preserved for posterity. The piece is signed “Marko93” though it’s indeterminable whether the numeral denotes the artist’s age or the year he composed this piece. 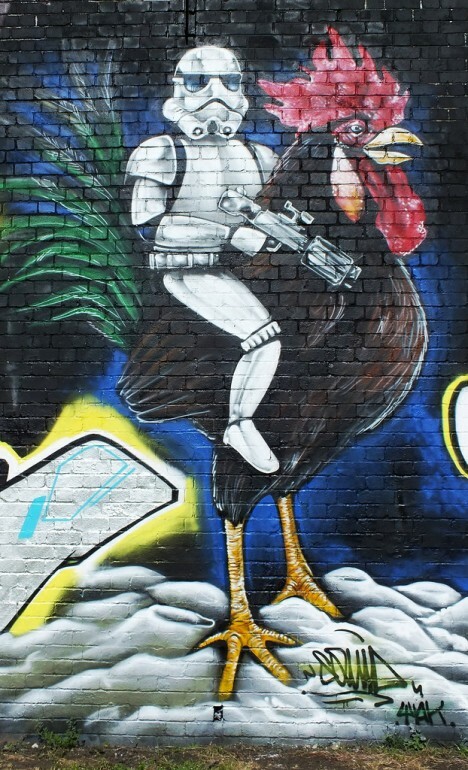 Strange goings-on in Cardiff, Wales, where Flickr user Squid…Mk recorded this rooster-riding stormtrooper on August 3rd of 2012. Will we ever see such a sight in some yet-to-be-made Star Wars flick? At the rate they’re being planned & produced, it might not take as long as you think!